I was born and raised right here in North Texas. Ever since I was young, I have always wanted to open my own business. After graduating from UNT Dallas, I put my business degree to good use and raised enough capital to open my very own coffee shop in a hip new neighborhood downtown. Choosing the right location for my coffee shop was a big deal for me. I knew that I wanted to attract customers and have access to a diverse and broad customer base. That’s why I chose to open my coffee shop near DART. I learned in school that transit-oriented development (TOD) or communities that have access to different forms of transportation reap many benefits, including drawing in a denser population. I now can serve my coffee and espresso to North Texans commuting to work in the morning or hopping on DART to run errands. As I was opening up shop, new construction was happening all around me and there are more businesses popping up every day. Mixed-use urban environments, like these, provide a great blend customers made up of families, residents, visitors, commuters, and shoppers! Watching North Texans come on and off of DART every day made me wonder just how public transit contributes to the new development I saw happening all around me. I did some research and found out that completed or under construction transit-oriented development near DART stations has already generated $69 million in state and local tax revenue! I know that I chose the right location for Alex’s Coffee. I can hardly keep up with the morning crowds, and with the new apartment buildings opening up every day, we have a bustling night business as well. Luckily, I’ve hired some great staff to help. Although, I don’t ride DART personally (I bike to work!) my employees depend on it. I’ve decided to recruit part-time help from my Alma Mater and pass on some of what I’ve learned about entrepreneurship to the next generation. As college students, it’s easy for them to hop on the Blue Line and be here in a snap. 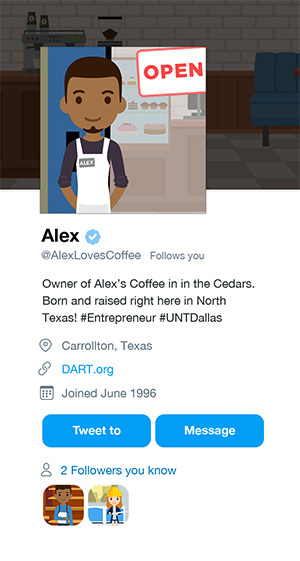 Without them and DART, I wouldn’t be able to caffeinate the hundreds of North Texans Alex’s Coffee serves every day!